In 2015, Jonathan Kipness and team became one of two research groups to demonstrate the existence of previously undiscovered meningeal lymphatic vessels. These fluid pathways connect the cerebrospinal fluid and cervical lymph nodes directly to the brain. In this follow-up study, the team found that dysfunction of meningeal vessel drainage increased Alzheimer’s pathology in mice. 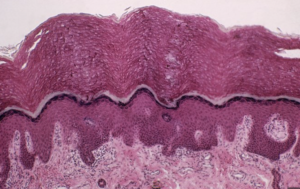 The interstitium is shown above as the light pink layer at the bottom of this image. This study documents a previously uncharacterized fluid-filled lattice of collagen bundles that connects all human tissues. This “human interstitium” may be even be classified as a new organ. And because the interstitium drains directly into the lymph nodes, it may also connect immune cells + microbes to the central nervous system. The team identified microscopic channels that connect skull bone marrow to the lining of the brain. Under conditions of inflammation these channels transport neutrophils (and possibly associated pathogens) directly from the marrow into the brain. The team found that, instead of being a “useless organ,” the appendix appears to be an immune tissue responsible for the sampling and monitoring of pathogens. They also found that appendix surgical samples removed from patients with Parkinson’s disease contained alpha-synuclein, suggesting that the Parkinson’s disease process might involve the appendix. Since alpha-synuclein appears to have potent antimicrobial activity, the findings further support a role for chronic infection in Parkinson’s.